WHOAS needs your help now! 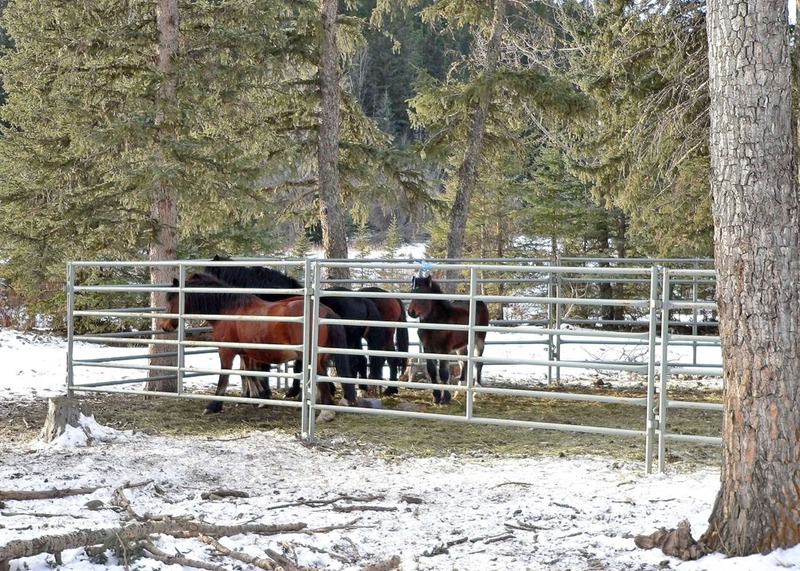 Please write and/or email Diana McQueen, Minister of Environment and Sustainable Resource Development, to tell her that the government needs to stop the capture of our wild free-roaming horses in Alberta. Here is a sample letter you can use – either copy it and paste it into an email to her or print it off (it’s also in a .pdf format) and mail to her. Did you know . . . any time after November 1st, the government can issue capture licenses to horse trappers? Did you know . . . 99% of all wild horses captured end up slaughtered? Do you part. Speak out and send your emails and letters to the Minister immediately. Over the past 2 years, I understand that over 300 wild free-roaming horses have been captured with the majority ending up slaughtered. I find this appalling. I have also found out that Sustainable Resource Development (SRD) estimates there are only 778 left in Alberta’s eastern slopes. They also admit that they are unsure about the numbers that could be sustained in this vast area. I believe the wild horses have been an integral part of Alberta’s heritage, history and culture. They deserve to live and be part of the whole ecosystem as it exists today in our Alberta foothills. I am writing to you to ask you to stop the capture for the 2012-2013 season. It is very apparent to me that more research needs to be done before more seemingly indiscriminate decisions are made. I attended the WHOAS presentation at the Calgary Area Outdoor Council on February 11th and was inspired by the commitment of Bob Henderson to Alberta’s wild horses. Following the presentation I mailed a postcard to ESRD and was pleased to receive a reply from Diana McQueen. I was encouraged to read there will be no licences issued in 2013 for the capture of the wild horses and that WHOAS are a stakeholder in the Province’s approach to managing the wild horses. Excellent small steps. Keep up the good work! please preserve the history of the wild horses. we are their voices . they are only wanting to live their lives free as the have for hundreds of years. .give them a chance to be allowed to live their life the way god has meant them to be . thank you for your time . i pray you will stop the gathering and slaughtering of these beautifull creaters of nature . Please do not allow anymore horse capture permits on our free-roaming Alberta wildhorses..this is not right as most of them end up at the horseslaughterhouses where they are killed very inhumanely…these majestic iconic animals deserve to live their lives in our Alberta. If a cull is necessary please consult people who care about them such as WHOAS and other sincere people who would not have them slaughtered. Please DO NOT contact Bill des Barres of the Horse Welfare Alliance of Canada as I have been told that he is pro-slaughter and has connections with Bouvry Exports. Thank you for allowing Bob Henderson of WHOAS to take part in the counting of our free-roaming wildhorses. I am hoping that the SRD and the Premier of Alberta will stop the slaughter of these horses and allow them to be designated as an Alberta Heritage Specie so they are managed and protected. This will win the respect of the people in Alberta who believe that the killing and destruction of the free-roaming wildhorses family units has to be stopped. Protection and Legislation must be done as soon as possible so that their history in Alberta can be preserved and recorded in positive ways. Thank you. These are truly magnificent animals! I can not understand that in AB people are making the same mistake as the BLM does south of the border. If there are too many mustangs they should be trained by professional trainers and then sold to the public instead of dropping them of at bouvry’s in Fort Macleod. I think the ranchers in the area have had their way long enough. As science has now proven that Alberta was the birthplace of original Horses is it not fitting that we should allow wild horses to have a place to roam. It would take very little imagination to have a place in Alberta that would allow these beautiful animals to continue to roam free. In other places the local Indians have been appointed to be their caretakers, has anyone approached them. They could cull the herd, when necessary, by breaking and training the horses for sale as they do in parts of the USA. The timber in their range area could be selectively logged for making and corral etc. The lumber could also build tourist stations to view the horses and buy memorabilia etc.Ponds could also be built that would also help in preventing flooding.For once it would be nice to see our Provincial Government think outside the box. I read the website re the capture of feral horses and received a letter from Diana McQueen on this issue. However, there is no information on what is done with the captured horses. It was my understanding that many people came forward to adopt the horses or send them to a rescue society, but regardless the government has decided to destroy them. If this is true, why is it? Why can’t the horses that are captured be put up for auction or donated to a number of organizations that use horses for such things as riding, therapy for autistic children etc. If WHOA would like to see the letter I received from the Minister, please send me an email and I will forward it as I see not contact information on your website. Just saw W5 on this today. From Ontario it looks like your Government department is corrupt. They have no studies, evidence, knowledge or truth but have reached a conclusion that more management is needed! Haven’t they heard your province is in tragic financial shape? There must be other ways to spend money. And I thought Ontario had the lead on stupid narrsasism.